Our Kissmetrics integration allows you to track LiveChat related-data using Kissmetrics as well as find out more information about your customers. You can easily check who contacted you via chat and see which agent answered the client’s query. What's more, you can segment your customers on those who chatted/ didn’t chat with you. The integration helps you also detect and save LiveChat events to your Kissmetrics account. These events include: - Standard greetings displayed - Personal greetings displayed - Automated greetings displayed - Chats started (includes the email and name of the visitor) - Ticket forms displayed - Ticket forms filled in - Pre-chat surveys displayed - Pre-chat surveys filled in - Post-chat surveys displayed - Post-chat surveys filled in Kissmetrics is a business analytics and conversion platform that helps to create and improve marketing strategies. What's more, it lets you monitor all the metrics that are vital for your business development. Kissmetrics comes with advanced tracking and analytical features that will help you monitor customer trends. These insights will help to identify important patterns within audience segments. The tool will enable you to measure the impact of marketing efforts, improve campaigns, and know your users better. Plus, the solution connects sessions of activity across different devices. Integrate LiveChat with Kissmetrics and store LiveChat related data straight in your Kissmetrics dashboard! Without any additional actions you can easily store and then analyze how your customers are interacting with LiveChat on your website. Our Kissmetrics integration is easy to configure. With just a few simple steps you will start collecting data about your LiveChat account. What's more, we will provide you with the step by step tutorial that will help you with the entire integration process. We will also automatically store all data in your Kissmetrics panel. With LiveChat comes tons of customer data — the pre-chat survey collects contact details, the chat transcripts give powerful sales insights, and post-chat survey can be used to gather feedback. The LiveChat-Kissmetrics integration gives you the ability to see just how effective LiveChat is at increasing conversion rate. 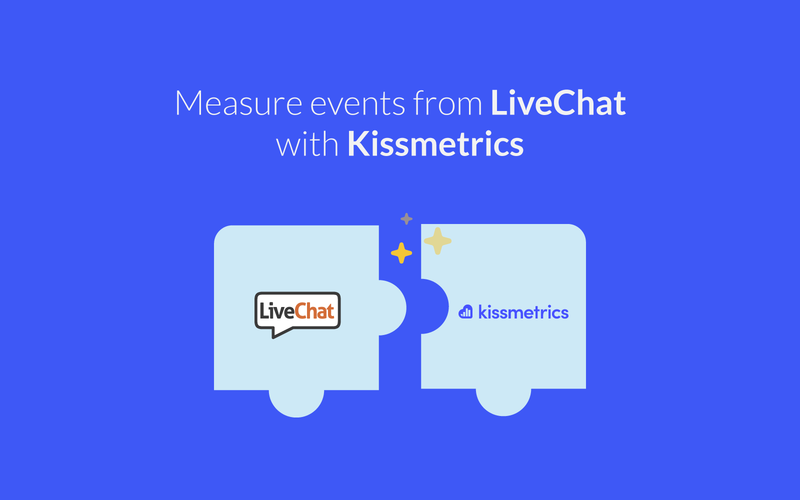 Start using LiveChat with Kissmetrics now!